For decades, engine designers and antifreeze formulators have tried to overcome the intrinsic shortcomings of water because there has been no viable alternative. 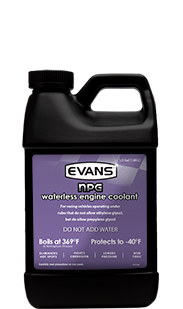 Evans manufactures the ONLY line of waterless engine coolants. 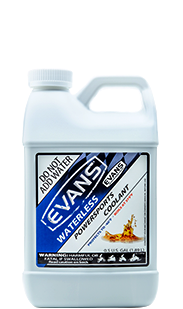 Evans coolants do not use water, and therefore eliminate the engine problems caused by water. 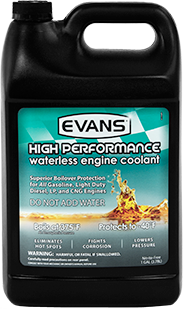 Steve Williams takes NHRA Super Comp World Championship running Evans Waterless Coolant › When Steve Williams clinched the 2018 NHRA Lucas Oil Drag Racing Series Super Comp World Championship in Pomona, he also became the first NHRA drag racer to win the title running Evans Waterless Coolant. Saturday night we battled through a very tough field of PDRA Lucas Oil Elite Top Dragster competitors from all over the United States and Canada to bring home an event win at the 2018 PDRA Drag Wars at GALOT Motorsports Park (Dunn, North Carolina). We couldn’t have achieved this win and our continued success both on and off the track in 2018 without Evans! 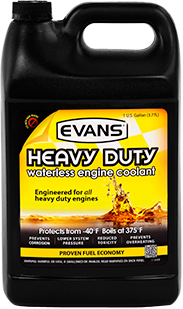 Coolant vs Metal Temperature › I recently saw on a forum someone asking how it can be possible to see a higher coolant temperature at the same time as our coolant is keeping the engine cooler. It's not as crazy as it sounds!